Coming soon to your US tourist sites and church conferences: Israel’s two new campaign armies: Anti-BDS Warriors and Smiling Tourists. Israel wants you to forget about the grief and suffering that continues in Gaza. They are telling us the Goldstone Report is so yesterday. Thanks to US pressure, the UN will wait another six months to act on the report. The death of an Hamas official in Dubai? No problem; the story created barely a ripple in the US, while European headlines quickly morphed into huffy officials calling in Israeli ambassadors to discuss stolen passports. The “Israeli Ministry of Public Diplomacy” (IMPD) sounds so Orwellian that it seems almost unfair to mention it. But you decide what’s fair in the IMPD’s smiling tourists campaign to issue happy talk hasbara kits to Israelis traveling outside their homeland. Yuli Edelstein, who runs the IMPD, calls his volunteer Israeli travelers the Tzva Hasbara LeYisrael, the Israeli Public Diplomacy Forces, a play on the Hebrew name of the IDF (Israel Defense Force) and the concept of “hasbara” or public information. Thousands of citizens are willing to help get across the message that Israel is a modern, democratic country with an impressive list of achievements. Now they can learn how. The preparation runs from workshops for official delegations to pocket pamphlets distributed at Ben-Gurion Airport for regular travelers, and – as becomes the modern media age – information contained on the newly created Web site. The new English-language site is due to go on line in April. It will join the Hebrew site Masbirim.gov.Il, which has attracted around 150,000 “hits” since it debuted two weeks ago. Minister Edelstein reports that training sessions have begun. A pamphlet describing “how to defend the country” is being distributed to departing passengers at Ben-Gurion Airport. It is hard not to conclude that these pamphlet-holders will see themselves as Israel’s Good Cops on the corner, helping little old ladies across the street and patting little children on the head. Message: Your friendly policeman is here to help you. The Good Cop Israelis will explain to the American public that all is well in Israel, with its booming economy, its beautiful new, secure, protected, highways and all those newly built housing units nestled among the West Bank’s green-covered hills. But Public Diplomacy wars are not won by Good Cops alone. A PD army needs its Bad Cops as well. Enter the anti-BDS (Boycott, Divestment, Sanctions) warriors. Two recent punches were thrown by the Bad Cops, aimed at Christians in particular. Both came from the Simon Wiesenthal Center, named for the zealous Nazi hunter. The first punch thrown appeared in the Jerusalem Post. It is a doozy. with a headline that says: “Liberal Protestant Churches Pose Growing Threat to Israel”. That’s Iran nuclear attack language. So pay attention. Israel is facing a threat from theologians and activists in prominent Protestant churches throughout the world, in addition to the threats posed by “lawfare” and the Goldstone Report, Rabbi Abraham Cooper, the associate dean of the Simon Wiesenthal Center, charged on Tuesday. Cooper was speaking at a plenary session of the seventh annual Jerusalem Conference in the capital. According to Cooper, the center of the Protestant theological war against Israel is the Geneva-based World Council of Churches, an umbrella organization of liberal church bodies, boasting a worldwide following of 380,000 members in 349 churches. He said one of the most prominent denominations in the WCC is the Presbyterian Church, which was the first to call for divestment from Israel. Cooper warned that 50 members of the US Congress belonged to the Presbyterian Church and, although many of them were friends of Israel, church policy was run from the top by a tight group of activists. Rabbi Cooper singled out three documents that trouble him: The 2007 Amman Call, the 2008 Bern Perspective and the 2009 Kairos Document. To access the documents that trouble Rabbi Cooper, click on the name of each document, download, print and study the full texts. In web language, an H/T (hat tip) goes to Rabbi Cooper for reminding us of these three documents that should be studied in local churches. The second punch was thrown inside the US, with a warning issued by the Simon Wiesenthal Center in a news release sent to the media and to the Center’s mailing list, which, from what I have heard, landed in the mail boxes of not a few Presbyterian pastors and lay persons. Once again, relations between the Presbyterian Church (U.S.A.) and American Jewish leaders have hit a rough spot – with criticism emerging of a not-yet-finished report on the Middle East that’s headed to next summer’s General Assembly. Now that’s the opening of a press release that is so cautious that you just know it had to have been vetted by “all sides” up and down the bureaucratic ladder. Or maybe the writer vetted herself, knowing the team she plays on. Remember the scene in the movie, O Brother, Where Art Thou? what Ulysses Everett McGill (George Clooney) said when he looked down from his hiding place in the barn and saw the sheriff’s posse waiting below? Understatement can be an effective linguist tool, or it may reveal an urgent need to accommodate the unaccommodateable. I do not fault my journalistic colleague who produced the release. I have spent a lifetime as part of the Church Eternal, forced to accommodate to all sorts of passionate believers, zealots, bigots, and just plain ill-informed pew-sitters, not to know that folks who run The Church must walk with bare feet on paths littered with broken glass. The Outlook website felt obliged to report, with far greater respect than it deserved, the distorted language of the Weisenthal alert. A poisonous document? Martin Luther King’s Letter from the Birmingham Jail was called worse by defenders of racial segregation in Alabama. Declaration of war? That is harsh language to use against Presbyterians who believe in non-violence. The Presbyterian Church USA is, indeed, in a tight spot, besieged by members across the nation who believe God promised the Jewish people the land that was to include Judea and Samaria. Others less biblically literal about such matters, are nevertheless obsessed with their “fragile relationship” with local rabbinical colleagues. They are the “soft” warriors, the PEPs, Progressives Except on Palestine, and the loyalists to the status quo then in effect. When fighting on foreign soil, the Ministry of Public Diplomatic must develop local loyalists who will support smiling tourists. as they await further prodding from the more militant anti-BDS warriors. Hasbara, in all of its forms, works best when it is supported from within, either from conviction or caution. One day we may look back and recognize both the soft and hard anti-BDS warriors as equally guilty of denying justice for both Palestinians and Israelis, just as hard-line segregationists and “go slow” Christians, delayed racial justice in the American South. On January 27, 1965, Atlanta’s leading citizens gathered in the Dinkler Plaza hotel dining room to honor Martin Luther King, Jr., one of their own citizens, who had recently been awarded a Nobel Peace Prize. In the film, Driving Miss Daisy, we hear a portion of the speech Dr. King gave that evening. It is a scene heavy with symbolism. Miss Daisy (Jessica Tandy) sits in the hotel dining room next to an empty chair. Her son, Boolie Werthan (Dan Aykrord) a local business executive, had declined to join his mother at the dinner. He said he was afraid if he attended, he would lose business, and his competitors would start calling him Martin Luther King Werthan. As the speech continues (King’s voice is heard; he is not seen), Miss Daisy’s driver, Hoke Colburn (Morgan Freeman) sits in her car outside, listening to the car radio. The camera cuts back and forth between Miss Daisy in the dining room, and Hoke in the car, each one listening to the speech from separate locations. We can see that the South has marvelous possibilities, yet in spite of these assets, segregation has placed the whole south socially, educationally, and economically behind the rest of the nation. Yet there are in the white south millions of people of good will whose voices are yet unheard, whose course is yet unclear, and whose courageous acts are yet unseen. . . .
History will have to record that the greatest tragedy of this period of social transition was not the vitriolic words and the violent actions of the bad people, but the appalling silence and indifference of the good people. Our generation will have to repent not only for the words and acts of the children of darkness but also for the fears and apathy of the children of light. 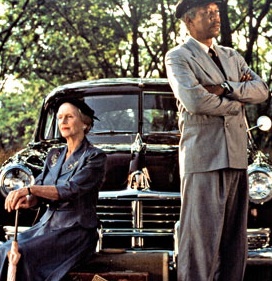 The picture above is from the film, Driving Miss Daisy. This entry was posted in -Movies and Religion, Middle East Politics, Religion and politics. Bookmark the permalink. Whew! Is Israel feeling threatened? Let’s keep up the pressure. As a United Methodist we are right behind the Presbyterians, seeking and speaking the truth. It’s time the facade Israel has created implodes and they are held accountable for atrocious human rights abuses. Will the propaganda never cease. The more the propaganda the greater is the suspicion that an attempt to hide the truth is being made. In the end the truth will out. As a white Presbyterian for over eighty years, a resident of the Middle East for a decade, and a supporter of the rights of both Palestinians and Jews to have a place to live in Palestine, based on the principles of human rights, justice and the Geneva Convention, I must thoroughly disagree with the Weisenthal’s distortions being fostered on the American public. The good news is that apparently Israel is worried. The bad news is that this will probably be effective. How to counteract? The problem is the name recognition and the automatic sympathy with an organization that is still fighting against the atrocities of the Nazis. It is time people learn they need to evaluate an organization’s words and actions on each activity, rather than automatically accepting everything they say. Thanks for the great article. I was aware of the response of the Weisenthal Center from an email I received from the Presbyterian Outlook. But I wasn’t aware of the current public relations education efforts going on. That is very disturbing and does sound very Orwellian. How to counteract? Spread the word. Start with your Presbyterian friends who are being inundated with false and distorted propaganda. They have General Assembly votes this summer. World Council of Churches “580,000 members.” I don’t think so! Checking with the World Council Of Churches website they say 560 million members are in their 349 member churches. It would seem like the WCC could influence the small 7.5 million population of Israel to come to a peaceful and just solution in Palestine. I just wanted to tell you about a demonstration last Friday in Silver Spring, Maryland that I thought you and your readers might find of interest. In support of the Palestinian call for Boycott, Divestment and Sanctions against Israel, dozens of Washington DC Metropolitan Area human rights activists protested The Israel Ballet performance at Montgomery College, Performing Arts Center in Takoma Park, MD on Friday night. Protesters, clad in tutus and tiaras danced, sang and chanted against Israel’s apartheid policies, criticizing the ballet for their complicity in covering up Israeli human rights abuses. In 2006, Israel’s Ministry of Foreign Affairs launched an initiative called “Brand Israel”, to salvage Israel’s deteriorating image abroad, sending well-known novelists, writers, former ministers, theater companies, and exhibits overseas to “show Israel’s prettier face” in an attempt to conceal the fact that it is committing grave violations of international law and denying basic human rights to the Palestinian people. Sponsored by local chapters of US Campaign to End the Israeli Occupation, Peace Action, and Codepink: Women for Peace, Friday’s protest is part of the national campaign to boycott all performances of the Israel Ballet during the ballet company’s February, 2010, US tour, because of their complicity in whitewashing Israeli apartheid. Activists wore tiaras, blue tutus, sang peace songs and danced to the tunes of Pete Perry’s music, chanted and waved signs that read “No tutu is big enough to cover up war crimes”, “Justice for Palestinians”, and “Don’t tiptoes around Apartheid”, as the ballet attendees were arriving. Endorsed by over 170 NGOs, trade unions, political parties, networks, and campaigns representing Palestinians inside and outside Palestine, the Boycott Divestment and Sanction (BDS) of Israel Campaign is a nonviolent form of resistance to oppression inspired by the historic role of the international community to fight injustice, as exemplified in their struggle to abolish apartheid in South Africa through diverse forms of boycott including academic and cultural BDS.